Come From Away: Welcome to the Rock - a fully illustrated companion volume to the hit Tony Award-winning Broadway musical, featuring the book and lyrics for the first time in print. Come From Away tells the remarkable true story of 38 planes and 6,579 passengers that were forced to land in Gander, Newfoundland, on September 11, 2001, doubling the population of one small town on the edge of the world. The people of Newfoundland opened their arms to the displaced, offering food, shelter, and friendship over the course of five days, and the travelers never forgot their heartfelt generosity. Come From Away: Welcome to the Rock is the ultimate companion piece to the Tony Award-winning hit musical by Irene Sankoff and David Hein. 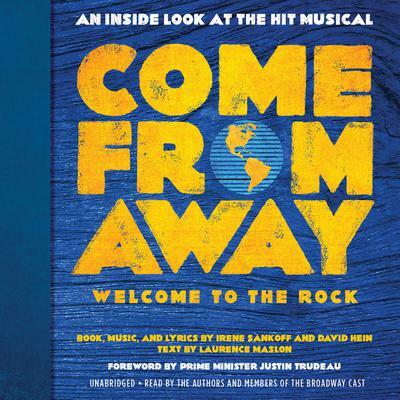 Featuring Irene Sankoff and David Hein's complete book and lyrics for the first time in print, exclusive photos and illustrations of the cast, up-close details of the costumes and set, and new interviews from passengers, Gander residents, and the actors that lined up to audition to portray them, and much more, Come From Away: Welcome to the Rock gives an unprecedented look behind the curtain. With a narrative by theater historian Laurence Maslon, the journey of the musical's development is traced from the backdrop of one of the darkest days in American history to the ten-year reunion of Gander residents and airline passengers, which sparked the show's creation. A beautiful collector's item, this book places readers far and wide in the town of Gander and backstage at the Gerald Schoenfeld Theatre - and all the places along this show's incredible journey. Because we come from everywhere, we all come from away.